Or, Cleaning out the Freezer, Part Whatever. The other thing taking up entirely too much room in the freezer was a bag of avocado pits and skins. After spending a lot of time Googling around for some sort of prescribed recipe I decided to wing it. Some did separate batches of just pits or just skins and some threw them all in together. Nobody seemed to use a mordant of any kind. Since I had some small pieces of crepe de chine with various mordants I decided to try a couple of different things. First I simmered the skins and pits together for about and hour and then let it set over night. I did my best to keep it from boiling since this can mess up the results with a lot of things, better to err on the side of caution. Then I strained out all the skins and pits, the dye liquid looks just lovely! I divided my dye liquid into three batches. I used enamel or stainless pots for all. 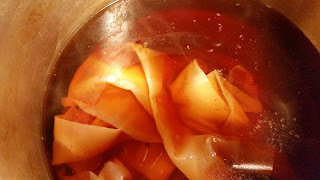 In one I did plain silk in the vat. The second one was with a piece of silk that had a pretreat with alum/cream of tarter in the normal manner. The third was in a neutral pot, but the fabric itself had a pre-boil in an iron pot with some vinegar. The plain and the alum samples I let simmer for about an hour and left to set over night. I knew the piece with iron particles would get dark and I didn't want to turn it completely black so I could eco print it later. I only let it go for about 45 minutes and then took it out, gave it a rinse and hung it to dry. Since most people were getting some sort of mauve pink, my results were a bit puzzling. 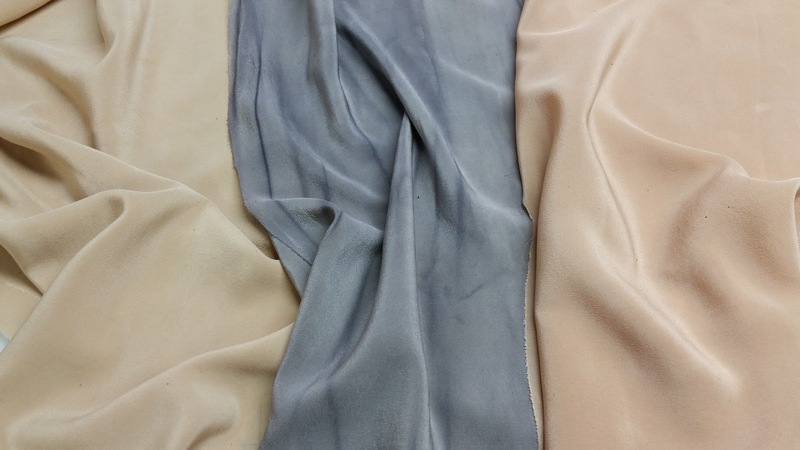 From left to right, the first is the alum, the second is the iron pot as mordant and the third is the plain silk with no mordant. It is the best color of the three, a lovely soft peach. The gray in the middle I will eco print with leaves and see what happens. The one with the alum pre-mordant will make a trip through something else to improve the bland beige. The only thing I can think of is water quality, my rain barrels are frozen solid so this was all done with the tap water which is rather hard. The goal now is to eat more avocados and get another stash going for this spring when I have rain water to work with. 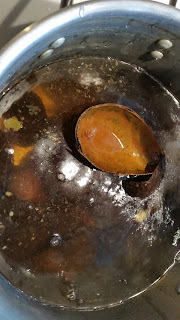 I won't use a mordant and I will do two batches, one with just the pits and one with just the skins. Eco printing these samples will tell me something about the permanency of the color.